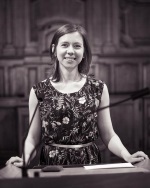 María Óskarsdóttir recently obtained a PhD in Business Economics at KU Leuven. After finishing a master’s degree in mathematics, she joined the Management Informatics research group at the Faculty of Economics and Business where she spent the last four years in pursuit of her PhD. The title of her dissertation is ‘Leveraging Mobile Phone Data and Social Network Analytics for Profit Driven Modeling’. Jasmien Lismont recently obtained her PhD in Business Economics at our Management Informatics group at KU Leuven university. The title of her dissertation is ‘From Bit to Business: Addressing Managerial and Practical Challenges of Analytics Adoption’. We talked to her about life as a PhD researcher, her academic work and recommendations for students starting this program. Why did you decide to start doing a PhD? María: After finishing my master’s degree, I was not really ready to go to industry and start a typical 9 to 5 job. I was looking around for interesting alternatives when I came across this PhD vacancy with professors Jan Vanthienen and Bart Baesens at KU Leuven (Belgium). The research project felt like a perfect opportunity because it allowed me to apply the theory I had learned during my mathematics studies in a more applied environment and use my computer science and statistics skills. I also saw a chance to advance my knowledge of economics and business. Doing a PhD gives you the unique opportunity to work extensively on a problem and develop unique research skills. You also get to meet many interesting people, travel to conferences and present your work to experts in the field. Jasmien: I first started to become interested in doctoral studies after an info session at our faculty. I wasn’t sure what my next career step needed to be. Starting a PhD program allowed me to discover where my true interests lie. Moreover, I would start on a research chair under the supervision of my main promotor, prof. Jan Vanthienen and co-promotors, prof. Bart Baesens and prof. Wilfried Lemahieu, which guaranteed me that my research would be applied in a business context. This contributed to my career opportunities after my graduation. In close collaboration with my supervisors, I was also able to focus on innovative projects within my own scope of interest. Contrarily to working in consulting or industry, I could set my own goals, dedicate time on presenting relevant and reliable results, and apply state-of-the art analytics algorithms. For the data science enthusiasts among us, this allowed me to do some cool things and sparked my interests towards data analytics even further. Last but not least, when you start a PhD, you get thrown into an enjoyable working atmosphere among other young, intelligent people. In addition, you’re able to travel! I went to various conferences in and outside of Europe and a research stay in the USA, to places where I’d never been before and I met interesting people from all over the world. What do you consider to be important skills for a good PhD student? Jasmien: Time and project management! Often you are the main responsible for a project, and managing your own time and the participation of the other researchers can be a challenge. In addition, it is important that you have an eye for detail, so that your research is well founded, relevant and reliable. Finally, analytical skills are important regardless of your research domain. And good writing skills will definitely also help you in writing down your work. What are important things you learned? María: I think everything I learned is important, but most of all the capability to work on an extensive project for a prolonged time and to carry out all the work that it takes to finish a PhD thesis. Four years is a long time and sometimes is it difficult to stay focused on your research. Getting a paper published in a journal can be a long and tedious process, so you learn to be patient and persistent. It is really easy to doubt your contributions, but you learn to have confidence in yourself and your work. What were the key findings of your research? Jasmien: In my research, I zoomed in on the challenges of adopting analytics in business. Analytics is becoming more widespread and accepted in companies, but nevertheless they struggle to integrate it into their culture and decision-making. I studied this from two perspectives. The first part of my work focused on managerial aspects. Based on survey research, we described the current analytics environment in relation to five defining pillars, namely the data, the enterprise, leadership, targets, and analysts. On each of these dimensions, companies can grow their analytics capabilities. Next, by means of an experiment, we studied the impact of (partially) automating analytics on the organization. These platforms can help to close the gap between data science experts and domain experts. In the second part, we focused on two practical use cases, in accountancy and retail, which leverage similarities and social interaction between entities. Both studies show the potential of using this new type of data representation and techniques, i.e. network-based analytics. As such, I proposed several ways to deal with both managerial and practical challenges of adopting analytics. I presented novel findings, insights and models which can improve the analytics maturity of companies and leverage the massive amounts of data they are storing nowadays. Based on survey research, we described the current analytics environment in relation to five defining pillars, namely the data, the enterprise, leadership, targets, and analysts. On each of these dimensions, companies can grow their analytics capabilities. María: In brief, I studied the added value of combining mobile phone data with social network analytics with the goal of boosting the performance of analytics in two strategic applications, namely churn prediction and credit scoring. In the rapidly growing world of data science and analytics, data is an asset that gives companies a competitive edge in fierce and saturated markets. To make the most of all the available data and resources, it is necessary to be mindful of each phase in the analytics process. More specifically, analyzing the appropriate data with the right techniques and befitting evaluation can make a strategic impact for the problem at hand. Alternative data sources can be challenging to incorporate in analytics applications because they tend to be unstructured and difficult to process. However, they may possess valuable information that should not be overlooked. I used mobile phone data, which has the benefit of providing a true representation of people’s behavior. Social networks are important in day to day life and as such, a valuable component in predictive models involving human behavior. Preprocessing the mobile phone data in a specific way to construct networks gives the opportunity to extract alternative information that provides a novel perspective on the observations in the dataset. In my research, I worked on a few projects where I used mobile phone data and social networks to enhance the impact of analytics models. The first project was a benchmarking study of social network techniques for churn prediction in the telecommunication industry. I provided a ranking of two dozen network learning techniques based on their predictive performance, as well as a comparison of churn prediction models applied to features and influence scores extracted from the networks. In the second project, I used mobile phone data and social networks to predict the creditworthiness of potential borrowers. The study combined mobile phone data with bank history data of over a million bank customers to build social networks that were featurized before training predictive models with results showing that features representing personal calling behavior are most predictive of creditworthiness. I also illustrated how our new research findings could help improve financial inclusion in developing countries with limited or no historical credit information. In the third project, I approached the networks from a dynamic perspective and built a sequence of networks to provide a time series of behavior based features and classified them using similarity forests. This novel technique of building and featurizing networks performed better when predicting churn in the long term. As a researcher, it is always fun to see how your research results are being used by others. In fact, I am currently reviewing a paper which builds further upon this third research project. In the rapidly growing world of data science and analytics, data is an asset that gives companies a competitive edge in fierce and saturated markets. To make the most of all the available data and resources, it is necessary to be mindful of each phase in the analytics process. Is it true that a PhD is an individual project? María: Yes and no! Of course you do most of the work, it is your PhD after all. You are also responsible for getting the work done, staying on top of current research and meeting deadlines. Since you are doing research and creating something novel, there are not that many people that understand the problems you face. Therefore, it can sometimes be a bit lonely. But at the same time you are not working alone, writing a research paper is a joint effort. You have for example your supervisors that guide you and give you feedback on your projects and your progress. You also have various collaborators that are experts in the field and you learn a lot from working with them and they also make the research more enjoyable. I was also very lucky to be a part of a research group with other PhD students working in fields related to mine. As we are all working towards the same goal, we help each other out, which makes life at work very pleasant. Jasmien: In theory, one accepted journal article is necessary in order to be able to graduate at our faculty. But in general, it is important that you’re able to communicate about your research with the community as well as practitioners. Discussing your work, receiving feedback and evolving is part of any PhD. This can be accomplished through internal seminars where you can receive valuable feedback from your colleagues, but also international conferences are encouraged. Finally, your work should also result in journal articles where experts in the field provide reviews on what you’ve done. Although this process can be sometimes tedious, it often leads to better articles even if you have to deal with some rejected papers first. Nevertheless, finding a good balance between conferences, internal publications and internationally reviewed journals is a continuous debate at universities. How do you start writing a research paper? María: In my experience, not at the beginning as I usually write the introduction at the end. It all starts with an idea of a research project followed by an investigation of the literature to see what has already been published on the topic. After some brainstorming with my collaborators to get other perspectives and alternative ideas, I start experimenting by writing code and running it on data. When I see that the idea is working and I have some exciting results I usually start writing, starting with the methodology section. I run more experiments while I work on different parts of the paper. Usually you need illustrative figures explaining the methodology and presenting the results, however, those can be quite tricky and time consuming to make. I finish with writing the conclusions and the introduction. When the main body of the paper is done, I work on the abstract which gives a good and concise summary of the contributions, methodology and results. I usually write my papers using Latex since it works so well for keeping track of references and the end result always looks professional and pretty. Jasmien: First, your research needs to be relevant. In the Faculty of Economics and Business, this often means that it needs to deliver relevant insights or guidelines to practitioners as well as provide novel contributions to existing research. Therefore, knowing the state-of-the-art and the business needs is important. Next, your methodology needs to be well-founded and motivated. When you’re writing down your work, you need to make sure that everything is clear so that other researchers can repeat what you’ve done. Structure is thus key to a good paper. Finally, I recommend to repeat your contributions regularly, i.e. in the introduction and the conclusion, so that it is clear why your work is worth reading it. What advice can you give to future PhD students? María: There are lots of ups and downs when pursuing a PhD. It is a unique opportunity to advance your skills and knowledge without the constant pressure of delivering something in the short run. Some days you feel like you have gotten nothing done, but when all comes to all and you take a long view, you see that all your hard work was worth it. 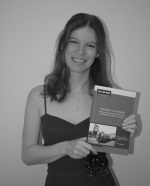 Finishing your PhD thesis and holding the printed copy in your hands makes you feel really proud. It is an achievement that you have mostly yourself to thank for and it is something no one will ever take away from you. So never give up, the end result feels amazing! Jasmien: Doing a PhD gives you many opportunities, to focus on what you’re interested in, to travel and to work with like-minded people. But it also demands dedication and discipline because you have the responsibility to make sure your projects are finished in time. This is something you should keep in mind when making this decision. Upon choosing your research group and topic, I would recommend to already think about the general direction of your future career and to make sure your research is relevant. I specifically started on a research chair which allowed me to apply data analytics on real data and cases. Moreover, the topic I worked on focused not only on the application of analytics, but also on the bridge between analytics and business, which is something I hope to further engage in during the next years after my graduation. Finally, doing a PhD is a rollercoaster. It makes you come out as a stronger person, but don’t be afraid to take your time to fail and get up again. The basis of good research, are good research questions and methodology. Keep this in mind with every project, and don’t be afraid to collaborate and share both the frustrations and the fun.